Stock status is current as of 4/24/2019 2:32 AMET. 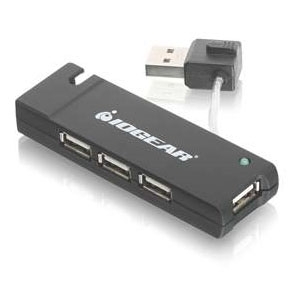 IOGEAR's 4-Port USB 2.0 Hub provides 4 Hi-Speed USB 2.0 ports for your USB connectivity needs. This device is USB 2.0 compliant and provides a data transfer rate of up to 480 Mbps (high speed). Compact and lightweight, the Hub is stylish and functional. The tuck-away USB cable design avoids cable clutter and makes the hub easy to carry and convenient to store. The side panel port design offers more convenience and flexibility. The Hub also supports USB 1.1 devices since it is backward compatible with USB 1.1 specifications. It is very easy to use, Plug-n-Play, and hot swappable.